This linear guide is made of a beam that travels in a rail. Length of both parts are designed according to customer needs. Strong, it encloses reinforced ball bearings that restricts twisting of the beams. It is a cheaper alternative to linear rails. Each rail can only include one moving beam. This linear guide is made of a beam that travels in a rail. Length of both parts are designed according to customer needs. Strong, it encloses reinforced ball bearings that restricts twisting of the beams. It is a cheaper alternative to linear rails. Each rail can only include one moving beam. This telescopic slide is designed for medium loads in applications requiring a very small footprint, such as covers or enclosures for guard of small machine. we do not recommend vertical mounting (guillotine) for this model. Recommended operating temperatures from -20 to 80°C. After modifications during manufacturing, we can go from -50 to 250°C. This product can be used as a sliding pair, guide bar or rod, suspended rail, handling rail, sliding doors horizontal slider or vertical guide. Chambrelans production of this guid rail is based on the use of cold drawn steel profiles. It has ball cages made of galvanized steel. Its ball bearings are made of 100C6 chrome steel. It is greased with a high pressure grease. The thin profile requires a milling of the frame. A food safe grease, combined with stainless steel ball bearings, offers a cheap alternative to stainless steel slides. It has no lock option so far. Other treatments ensuring better corrosion resistance are also available. Do not hesitate to contact us. A nitruration coating of the rail can be supplied, which offers, in addition to corrosion resistance, an increased resistance to hammering of ball bearings and a longer lifespan. 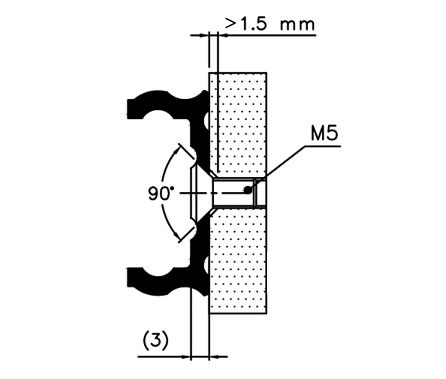 This option can be usefull in the case of intensive use or applications subject to vibrations. It can be mounted with stainless steel balls to get a very good corrosion resistance, which in some cases can provide an economical alternative to stainless steel slides. Use in high temperature (furnace): This model can be used in high temperatures environments: up to 250°C. However, adjustments are necessary: - Additionnal play in the assembly to allow the expansion elements without blocking the slide - Use of high temperature grease - Removing of all plastic parts. These adjustments on the slides should be performed in the factory, it is important to warn us with price request or order and to allow a delay for manufacturig. the zinc coating deteriorates above 120°C, we can offer other solutions. Development is a choice made during the design, which can not be changed thereafter. This slide can not be mounted vertically (guillotine). The characteristics given on this website correspond to standard manufacture or usual requirements. Our position as a manufacturer enables us to offer great flexibility in order to meet the most specific requirements. Chambrelan designs and manufactures thousands of ball bearing slides and linear rails for equipment manufacturers needing sliding guides.